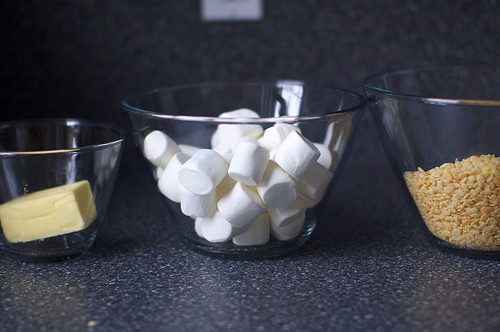 I found this amazing recipe on Cupcakes & Cashmere for Salted Brown Butter Crispy Treats from Smitten Kitchen. I was a little skeptical at first because I love the classic Rice Krispie treats but these were a huge hit. The brown butter gives them a nutty caramel taste, and the sea salt produces the perfect sweet/salty flavor. This recipe is a keeper. Yum! I will have to try this! Thanks. Yummmm! 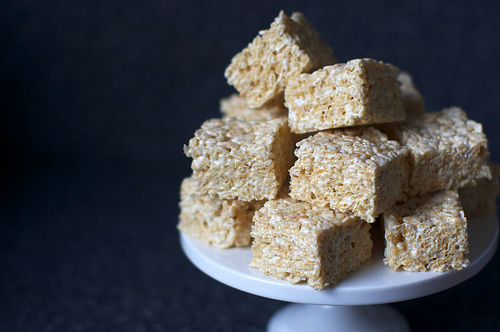 I love reciepes for sweets, and rice crispy treats are one of my faves. I like the idea of adding salt to the mix. oh my! this sounds AMAZEBALLS! must make them stat! I have GOT to make these... they were my fav after- school treats! Love your blog btw!